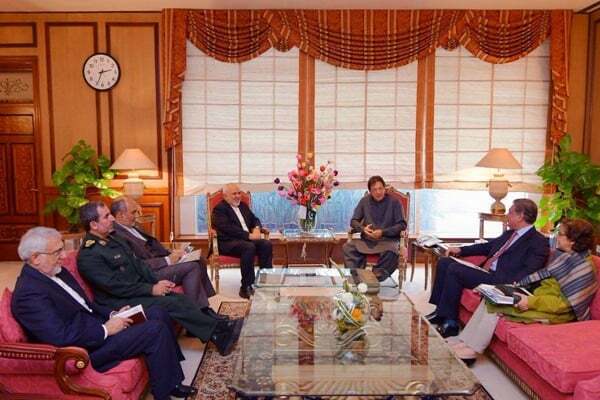 Iran’s Foreign Minister Mohammad Javad Zarif on Wednesday met with Pakistan’s Prime Minister Imran Khan in Islamabad. During the meeting, the two sides discussed the latest developments regarding the Iranian border guards abducted by terrorists. They also reviewed the talks already held between Iranian and Pakistani political and military officials to address the insecurity along the borders. FM Zarif and Imran Khan further highlighted the strong relations between the two states, and explored avenues for promoting bilateral ties, especially in the field of energy. They also conferred on regional issues, including Yemen and Afghanistan. Earlier, Zarif held separate negotiations with his Pakistani counterpart Shah Mahmood Qureshi and the country’s Chief of Army Staff General Qamar Javed Bajwa. Zarif left Tehran for Islamabad early Wednesday right after finishing his trip to the Turkish city of Istanbul during which he attended a trilateral meeting with his Turkish and Azerbaijani counterparts.